Do You Want a Brush with Greatness?! Have you seen the new Dove commercial with Glee star Lea Michele? She sings a beautiful rendition of The Sound of Music's "My Favorite Things." Well, Dove wants to hear you and your friends singing too. 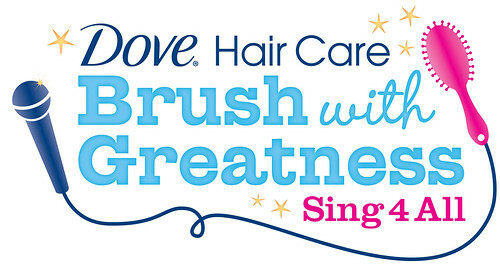 From now until November 21st, 2010, groups of 3-10 are invited to enter their Dove Hair Care Brush with Greatness Sing4All video contest! Winners will be given the opportunity to sing their full rendition of the classic song at Radio City's Christmas Spectacular, which will be held on December 28, 2010 in New York City. A gift package from Dove Hair Care. Sound like something you are interested in? Then I invite you to get a group together of your friends, glee members, theater buddies or anyone you can find and make your video. Entrants can download the lyrics and submit your video on the official contest page here. Not in the singing mood? You can help Dove determine the four finalist teams by voting on your favorite video performance at DoveSing4All.com.